Had several requests, so I thought I'd throw out some examples from our first year for discussion and learning purposes. Post your scores for appearance. After a couple of days, I'll post the real score and how well (or not so well) it did. Posted: Wed May 21 08 6:43 am Post subject: ? Looks pretty dang good. Wow, a smoke ring. How many people have gotten on here and said a pellet cooker can't do that. No scores from me, but I like that you put the burnt ends in there also on the side. That gets you an extra point on apperance from me. 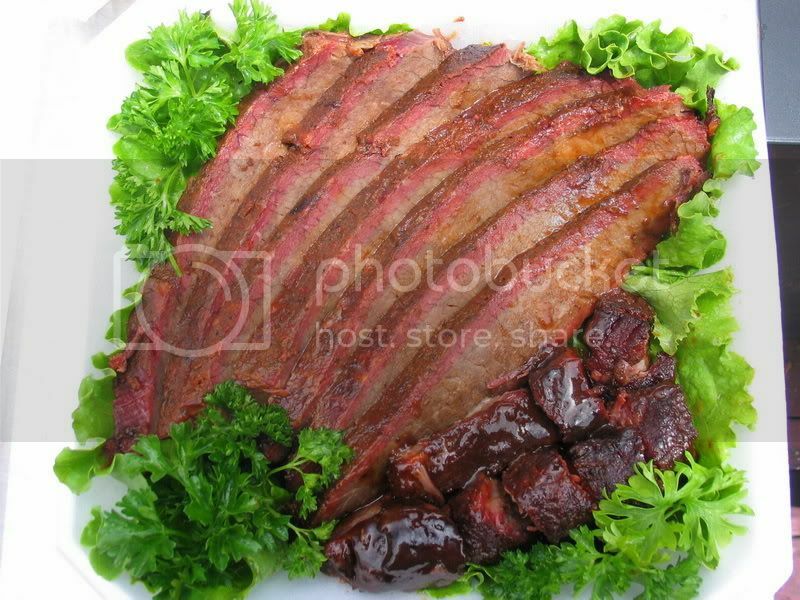 a 7 for me ... the brisket looks great ,but the lettuce is a little low in a couple places... but id sure like to eat it ..
With a little extra lettuce in places that would be a 9 for sure..
7 from me. as said before lettuce uneven on left side, and the top ends of the slices are chipped up (I wish I knew a foolproof way to prevent this in my own boxes). The burnt ends are a nice touch. Since we are only going by the picture, I'd give this an 8. The parsley in the lower part is hiding the brisket and the burnt ends "appear" to not be consistance in the amount of sauce on top. Keep the comments coming, we'll discuss in detail in a few days when more comments come in. I would say 9 on this. That is damn good looking brisket. I'd say 8 only because I had lot's of time to look at it. I saw some sauce spots in the lettuce and a couple of ragged areas on the cut slices. But in an actual comp I doubt I'd have time to see all that so really I'd say a 9. My perfect recipe... meat and smoke. 8, 9 if the parsley wasn't covering the meat. Looks great to me. Very informative thread. Couple of questions. How close is that sauce to "pooling"? Especially on that burnt end in the front and on that tip of sliced. The bark looks like you foil. Does anyone think judges are looking for a darker bark? I foil too so I'm very curious about this. The bark looks like you foil. Normally I don't like too, but if I finish 5 or 6 hours early, I had to. This was a tough contest, rained all night and the bark never set. Thanks so much for the four versions of this thread! I think it really helps new or inexperienced competitors (like me) to find ways to improve in an area that is often overlooked. I know I've left a lot of points on the table because my team did not think it through enough! I'll post my first two comps worth of boxes and let you pick at me for awhile. Russ, that is not a bad looking first timers box at all, but 988888? Was that a KCBS contest or a Church Social backyard contest? Not bad looking for first time but I would give it a 7. Its hard to tell from a pic. but the slices appear to be pretty thick, shouldn't they be about the size of a #2 pencil according to KCBS? Also could be a littel more garnish to fill out box. Also the garnish covers the meat in a few sopts. JMO. You did pretty good according to the scores though. Actually there is not a brisket slice thickness rule for KCBS. I think the #2 pencil thickness rule is either MIM or IBCA.